An alliance for whom, for what? It is widely acknowledged that the state of journalism today has reached a low point. It’s also acknowledged that individual journalists themselves fare no better. The situation has been analyzed and written about, with a substantial body of evidence emerging. The evidence can be quite disheartening, pushing many to desolation. At the same time, throughout the world a growing number of journalists are acting individually and in groups to create a body of critical thought and action on the issues of journalistic responsibility and ethics. The “freedom” to inform correctly cannot be separate from the concepts of “right” and “duty”, both closely linked with “responsibility”. For that reason the Charles Léopold Mayer Foundation for the Progress of Humankind (FPH) has been supporting, since 2004, the development of a dynamic international group for reflection and action on the theme of “responsible information”. This space will be first and foremost a constructive one, promoting exchange, dialogue, and the sharing of experiences. The goal is to create a base of collective knowledge and power to help influence journalistic practices. The group will refuse sectarianism, dogmatism and ideology. This alliance will refrain from advocating a single new model vis-a-vis the dominant model, and instead will focus on promoting a variety and diversity of approaches. Based on the convergence of professional and human values, the general themes of responsibility and journalism will be experienced in working groups by the acceptance of views to be challenged and debated. This process will be put in place for the duration, the alliance is open to all who wish to become part of it. The Charles Léopold Mayer Foundation for the Progress of Humankind (FPH), established under Swiss law, was set up in 1982 thanks to the heritage of Charles Léopold Mayer. The Foundation is engaged in contributing to the emergence of a world community able to conceptualize and initiate three areas of major shifts: the revolution of governance; ethics and responsibility; new models of development. This interest for an informal network of journalists falls under this measure of support to “citizen alliances”, which have a particular manner of self-organizing on an international scale to create a dynamic, abstract but nevertheless capable of a collective strategy, reconciling requirements of diversity and unity, of respect of autonomy within a global coherence. The international alliance of journalists is an informal network created at the initiative of the Foundation Charles Léopold Mayer for the Human Progress (FPH) in the framework of its support to the development of “citizen alliances”. The global objective of this open and constructive group is to work on the issue of “responsibility”. For that purpose, it proposes to the professionals of the media a space and a dynamics allowing the journalists, all over the world, to gather their reflections, experiences, concrete proposals to help influence journalistic practices. Its goal is to link up the media’s different actors to create a base of collective knowledge and work concretely on the reappropriation of a responsibility both at personal and professional, individual and collective levels. At the beginning of 1994, the Foundation Charles Léopold Mayer for the Human Progress launches a collective dynamics called the “Alliance for a Responsible, Plural and United World”. This international process, based on the permanent research of concrete proposals for change, is organized around topics, geographic places and socio-professional sectors. The crowning moment of this dynamics was in 2001, with the organization of continental meetings and of the World Citizens Assembly that gave rise to about 60 Proposal papers, to the Charter of Human Responsibilities and to the Agenda for the 21st century. Among the socio-professional groups, the media’s sector had been approached during two initiatives, to outline a "socio-professional network of journalists ", at the end of the 90’s. One in India, with the creation of the “Transforming Word" network composed of journalists editors, mainly Asian, wishing to take the floor on common challenges; the other in France, with the organization of two working meetings of about fifteen journalists who analyzed the institutional logics in which medias and journalists are confined; they also expressed some principles of responsibility. On the occasion of the World Social Forum of Mumbaï in 2004, the success of the workshop on the responsibility of journalists, organized along with the FPH, revealed a largely shared desire among the journalistic profession to continue the dialog and we then considered that this was the beginning of a veritable alliance of journalists. In August 2004, a group of 5 people in France, India, Brazil and the United States launched the international alliance of journalists. The territory of the alliance of journalists is international. On the topical level, beyond the national and regional specificities, the alliance organizes a movement of common thought and reflections. On the geographical level, some workgroups or "regional spaces" are constituted in the places where groups of journalists wish to get involved. in India (South Asian and Southeast Asian workgroup) - in the United States (North American workgroup), currently without facilitator. The alliance of journalists thus considers questionings common to the professionals of learning and knowledge which are discussed in alliances of executives, academics and researchers. the addressees of the information, either as consumers, users or citizens. The international alliance of journalists is an informal initiative. Its objective is not to take the place of the persons who participate in it, nor to speak for themselves, but on the contrary it should allow each one, through the links one builds with the others, to better affirm one’s identity and to be more efficient in the promotion of the journalists’ social responsibility. This alliance wishes to be non corporatist but federative of the different actors of the media sector. This initiative is a long term one. Its promoters and signatories are conscious of the importance of the transformations they wish to inspire and of the time required for them to emerge and be settled on an international scale. 1. The promoters of the initiative (see "founders and guarantors") share the conviction that the journalists and other producers of information have a responsibility towards society. They must practice it better and have the power to do so. The promoters also share the conviction that the press corporations have a very important impact on the all our societies. Their responsibilities are not limited to their legal obligations and must be better exercised. 2. The present charter, that defines the general objectives of the international alliance of journalists, is a starting point. The alliance wishes to be a consistent approach for change: from the awareness to the formulation of proposals, from experiences sharing to mutual training, from collective declarations to a possible research of new legal frameworks. The functioning of the alliance of journalists is based on the respect by all of common ethical principles. Registering the alliance doesn’t require any official procedure; a person can be included in this initiative only by willing and acknowledging the objectives and ethical rules of the present Charter. The allies as below are considered as participants. Each accepts being considered as participant to the alliance only according to his/her effective involvement in the common work. She/he accepts to lose this quality when this involvement disappears. Each participant abstains from claiming the authorship of the common initiative and obliges himself/herself, in his/her action, to mention its collective character. The participants commit themselves to seek coherence between their behaviors and practical professional on the one hand and the principles expressed in the charter of the international alliance of the journalists on the other hand. The participants commit themselves to share their experience with the others and try to make the alliance be a space to share knowledge, links and initiatives. The participants feel responsible for making the alliance alive, maintaining links with the other participants, talking about it, diffusing its works, participating in the effort of proposals elaboration. The participants respect the diversity of points of view and convictions expressed within the alliance, willing to identify common perspectives. The participants commit themselves to make the alliance of journalists an open space, welcoming to the others; to promote within it a culture of peace and cooperation. The participants respect the work procedures adopted in common and the common deadlines. Each regional coordinator reserves himself/herself the right to, after consulting the active group of his/her workgroup, unsubscribe anyone whose acts, words or thoughts would be contrary to the principles and rules expressed in the present charter. In the same way, the international coordination can also take a common decision in opposition to all participant or regional facilitator that would not respect these same principles stipulated in this text. The international alliance of journalists was born at the Foundation Charles Léopold Mayer for human progress, from the initiative of Pierre Calame and Manola Gardez. These two people are at the origin of the process, they drawn up its spirit and starting point. They make sure that the spirit and ethics of the alliance are respected; they maintain the respect of the guidelines and rules. They represent the active and operational body of the alliance, they take the ultimate decisions in case of divergence or conflict. The group of guarantors is - at the moment of the writing of this Charter, in October 2006 - composed of the general coordinator, Manola Gardez, and the alliance facilitators: Nathalie Dollé, Isis de Palma, Siddhartha and Bertrand Verfaillie. The group of guarantors will be enlarged by co-option. The international alliance of journalists has no legal identity. It belongs to no one but owes to be at the service of all. The international alliance of journalists is organized with important regional active workgroups. Each group articulates its activities to the topical priorities defined at the beginning of each year by the group of local participants along with the regional facilitator. These topics are identified according to the regional priorities depending on the social, political and economic context of the profession and on how the society perceives that professional sector. Each workgroup decides individually its own organization and activities, regardless of the other workgroups. Some facilitators for instance may choose to prioritize the quantitative development of participants; others may focus on specific initiatives outcomes involving previously identified actors. In addition, the alliance of journalists notes the diversity of actions required, at international scale, to transform these practices as well as the institutional and legal frameworks of that profession. It thus aims to set up, with all those who share the same convictions, its different actions. It claims to reach this goal by focusing on networking, without necessarily creating a new organization. Each workgroup includes active and less operational participants following the initiatives from a distance. The most active participants gather in local meetings, share the representation of the regional alliance, make research work for a collective use, write articles for the Alliance Web site or partners Web sites, fuel the reflection and elaborate documents, contribute to the completion of initiatives collectively settled, operate in trainings, etc. But generally, both the active participants, the punctual and temporary contributors and the sympathizers, are all bound by the above stated principles and rules. All are expected to develop the promotion of the initiative. The whole activities of the alliance of journalists and its international articulations are supervised by the person in charge of the general coordination. At least once a year, she gathers the facilitators of the different workgroups to share their actions and thoughts, to exchange on the assessments and perspectives, to relaunch the interregional articulations. This informal entity will be composed of qualified personalities and/or groups invited by the group of "guarantors". The Council will meet twice a year. Its duty will be to support, follow, opine on, advise and guide our dynamics. Its members will be invited to follow the activities, to answer our consultation requests, to participate in the in-depth discussions and to encourage the articulation with their own networks. This Council is therefore created to lead a reflection on the international alliance of journalists’ overall strategy. Each workgroup chooses its own internal communication system. Most often, it creates an email diffusion list to allow a complete circulation of information. All registered persons on these lists are considered as participants of the alliance. The Web site of the alliance is at the same time its public window display and the central working system. According to its specifications, the Web site should be a structured resource Website – a condition for unity – but with a decentralized functioning – a condition for the initiatives autonomy and the opinions pluralism –. Each participant therefore supplies information on the Website committing his/her own responsibility on the veracity and quality of the supplied information. The downloading and edition of the information, experiences and proposals published on the alliance Website are copyright free, provided no one publishes truncated information without source and all respect the bona-fide principle in not presenting information out of its context. At any moment and on the initiative of all signatory, a work group can be constituted to make good use of the wealth of the information, experiences, reflection and proposals accumulated on a given topic, in a given region or context. This initiative is published on the Web site and an invitation to participate is then sent to all signatories which experience and reflection are called upon. The results of the collective reflection of this workgroup are published on the Web site. Being itself an informal network, no one can speak in the name of the international alliance of journalists; each participant can only speak in his/her own name. However, the alliance might have to take a position or express a public speech. In that case, a procedure for a discussion on the local diffusion list must give the participants enough time to validate the text or speech to be made public. The Web site guarantors remain as such as long as they keep an active role in the development of the Web site of the alliance. Such an international dynamics, to be a long term one, requires important financial means. These are, in 2006, exclusively supported by the Foundation Charles Léopold Mayer for human progress. strategic financial partners who share the vision of the alliance, bring a long-lasting financial support and in that way involve their institution in this dynamics. The financial partners can be public or private. If a donor is to be a media corporation, deontology imposes its non interference. The actions and schedules are discussed collectively during the international coordinators meeting at the beginning of every year. 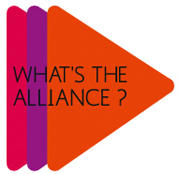 The plans of action and the working programs are then published on the Web site of the alliance for public consultation.